Want to update your Facebook status via different Costly Gadgets & devices such as: Blackberry, iPhone, Android etc… without actually using them? Its possible! Step 1. Login into your Facebook Account . 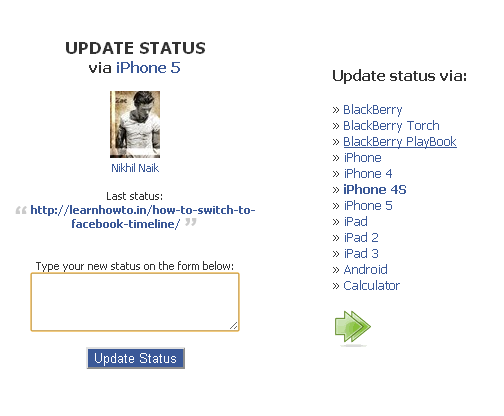 And when you Click on Update Status button , It will update Your Facebook Status. Its it simple! its all the clepomx facebook creates in our mind that we have an audience.. people do/say everything they do on fb to perform for their intangible audience.. its power comes in that you never have to really take responsibility for what u say/who u say it too, because you don’t know who exactly is looking at any given time its gone as far as people saying “goodnight” and “goodmorning fb!” in statuses as if they are addressing some sort of living thing..